I’ve spent the last couple of days at the university of Urbino, hosted by Fabio Giglietto as part of an ERASMUS teacher exchange between Westerdals Oslo ACT and the department of communication studies at the aforementioned university. Urbino proved to be a lovely little town – about 15 000 inhabitants live there, to which one has to add about the same amount of students, who mostly commute from out of town. 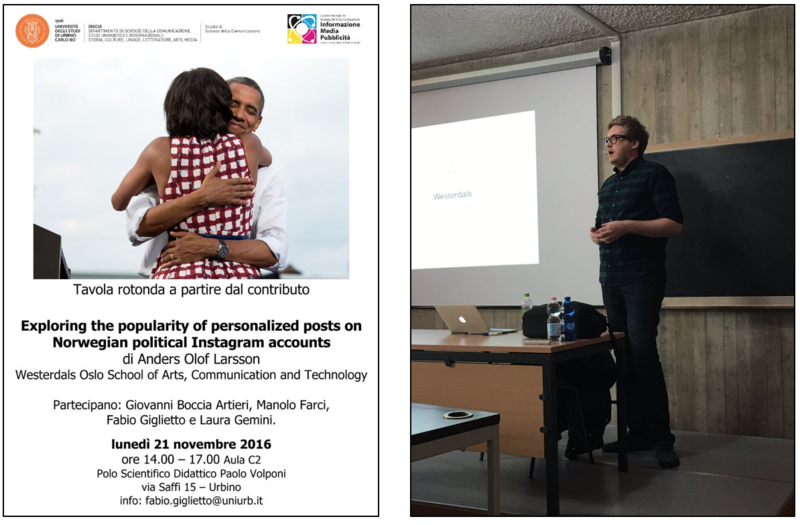 While in Urbino, I held a few lectures and seminars on the undergraduate as well as graduate level, discussing (among other things) the consequences of personalized content on the Instagram pages of political leaders. Please refer to the picture of me in action available above (thanks to Giovanni Boccia Artieri, who tweeted the picture).